Need to finish your crowd control system? These stanchion belt posts are made to be at the end of a barrier setup. Because these fixtures do not feature a retractable strap or rope, they have a simple design that can receive four tapes. 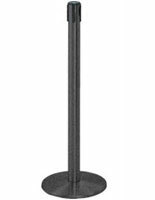 The stanchion belt posts, or queue poles, are all made out of sturdy metal that keep them upright in high traffic environments. Each is from the Tensabarrier series and can be used with a number of compatible accessories such as signs and carts for additional utility. 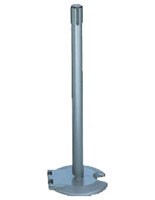 In addition, these stanchion belt posts come with a number of options that make them ideal for any user's needs. While all of these Tensabarrier queue poles are made of sturdy metal, they come in a number of finishes that can complement any interior. Match a crowd control system with polished or satin finished stanchion belt post on the end. With no retractable strap to worry about, buyers only need to consider the shade of the queue pole's metal exterior. These Tensabarrier posts also feature the option of a wheeled base that makes them easier to transport and store. This type of queue pole has a specially shaped support that allows four units to be moved at a time. Their stackable design also allows them to save space in storage. 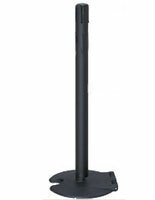 Alternatively, users can buy a stanchion belt stand with a normal base while also purchasing a cart accessory for assisting movement. These crowd control accessories feature a stable base that makes them ideal for any location, whether they have low or high traffic. 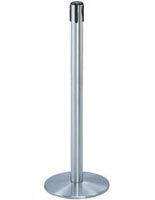 Locations such as cafés, restaurants and bars can use these stanchion belt stands to create lines and direct traffic. Even busy and chaotic event venues can use these Tensabarrier fixtures for the same reason as their stable metal base will prevent them from tipping. This type of post is also excellent for barring off inaccessible doors and hallways, especially with signage accessories that communicate "No Entry" or "Authorized Personnel Only".